Today I'll be looking at the latest addition to the Chaos;Head and Steins;Gate universe: Robotics;Notes. This is the story of a few high school students that try to build a giant mecha and get caught up in a global conspiracy along the way. From what I've seen of Steins;Gate, both stories generally start out in similar ways. 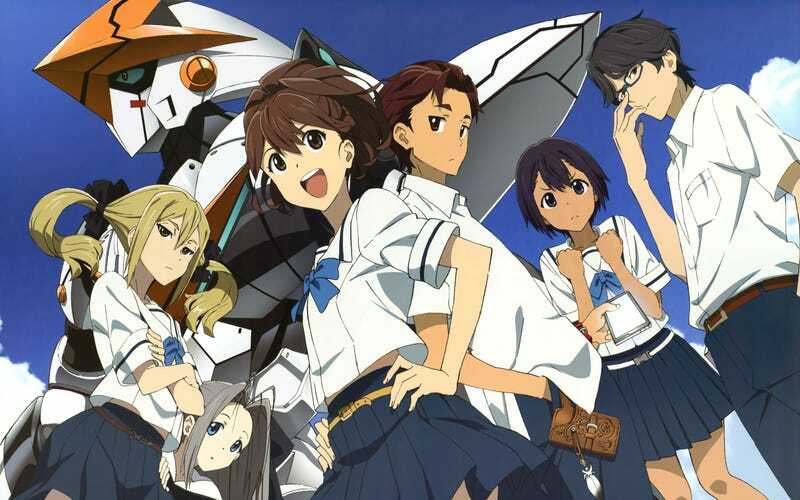 Robotics;Notes is a speculative fiction series that pivots on the robots motif. The show portrays the lives of the Robot Research Club in their efforts to make a fully-functioning giant mecha in the near-future. The two members of the club are Kaito and Akiho. Kaito is a stoic video gamer with little interest in robots while Akiho is a determined robot engineer. They form the hero and heroine of the story respectively. As the story moves on, the characters pick up some help on their journey toward completing the Robot Research Club's giant robot. The primary motif of the show is building a giant mecha and, for the most part, it pulls it off. It plays around with how a small school club would go about building one. It touches on the very real issues like the square-cube law and the allocation of proper resources. Still, even knowing this, the club doesn't quite have an easy ride to its end. There are failed prototypes, concessions to made, and money problems to overcome. Alongside this is a near-future world where augmented reality is a necessity. It isn't over-the-top or unbelievable in any way and I can see such technologies occurring in the next decade. It's a fascinating world to understand and explore. The overarching plot of this series combines the robot-building motif with a global-conspiracy plot like Steins;Gate. It's a twisting and turning plot that will keep you guessing until the very ending. There's a lot going on for the inquisitive viewer to track down and put together. Say what you will about Kaito, but I actually liked him a lot. He broke the usual character archetype that I was expecting into pieces and showed us a very different sort of hero. Steins;Gate has a crazy scientist and Robotics;Notes has... a normal kid. He seems to be a boring, stoic character with few redeeming qualities, but he actually is a rather capable and determined character, particularly as the series goes on. Call me crazy, but I think he was a great main character. He did a lot right compared to some of the main characters I've seen. Maybe I give him a pass because I knew someone like him in high school. Similarly, I thought Akiho was a great character. She's an engineer following in her sister's footsteps and her goal is to finish the Robot Research Club's giant mecha. She has hidden reasons for having this drive though, which makes her just complex enough to overcome her character tropes. At the same time, she acts like an anchor for the show's characters with her bright and normal personality. I will say that her visual design probably contributes to this. She's a very well-animated and designed character. Lastly, from what I've seen of Steins;Gate and Chaos;Head, I can safely say that I like Robotics;Notes animation far more. One of the gripes that I have with Steins;Gate has been its intentionally bland color palette and fuzzy lines. Robotics;Notes sidesteps this with a bright color palette and cleanly defined lines. It's very well done. By the end of the series, there are some unexplained elements that will grate on the viewer. The best way (and only way) to avoid this is to just not think too hard about it. While this is a speculative fiction story, some elements just to be accepted as either really convenient science or fantasy. One such example were the monopoles which were never really explained at all. They just sort of happened and we were expected to go along with it. I can't give it a pass, but I can say if you don't think about it, you'll be better off. There is a bit of shortfall with some of the narrative. There's a lot happening in this series, particularly at the beginning. Every character has a story and it all gets told very quickly so the narrative can switch gears to the real plot. When we finally manage to grind past the many plot threads and glide into the main plot, things improve. Minor Spoiler Warning (continue to Verdict to skip). Speaking of plot, I thought the love triangle plot was poorly exploited. I don't think there was any traction in it at all because there just wasn't enough time to flesh it out. I personally just preferred the Akiho/Kaito pairing and I didn't really get anything from Kaito/Frau Bow at all. 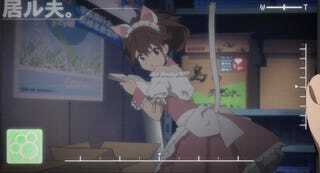 I've seen people give Robotics;Notes a bad rep on parts of the internet. I can't say I really agree with many of the negative assessments of the series. It does far more right than it does wrong. That said, this is not a game-changing anime that will forever change your life. There isn't much new or groundbreaking about it at all. It's a very familiar show. The plot is a twisting ride and the two main characters did very well in my book. The whole show plays with the concept of a giant mecha excellently and it explores the real-world implications of such a machine. There's real science that gets alluded to via carbon nano-fibers and the square-cubed law that only improves the feeling of a realistic look at the construction of a giant robot. I wish we would have seen more science though. All things considered, the show is a very solid watch and it kept my attention throughout its run. It's best for someone that likes a speculative look at the future. The overarching plot deals with a global conspiracy and it's a fascinating and mysterious story that more-or-less ends well. I rather enjoyed it and I'm glad I watched it. Remember everyone, we watch this for the plot. You can watch Robotics;Notes on Hulu and Funimation. As usual, I claim no ownership of the images herein. Header was retrieved from here. Ano Natsu de Matteru or Lagrange?